Layers of dark and white chocolate with crushed candy canes. You can spread the bark into a large slab and then break apart when hardened. 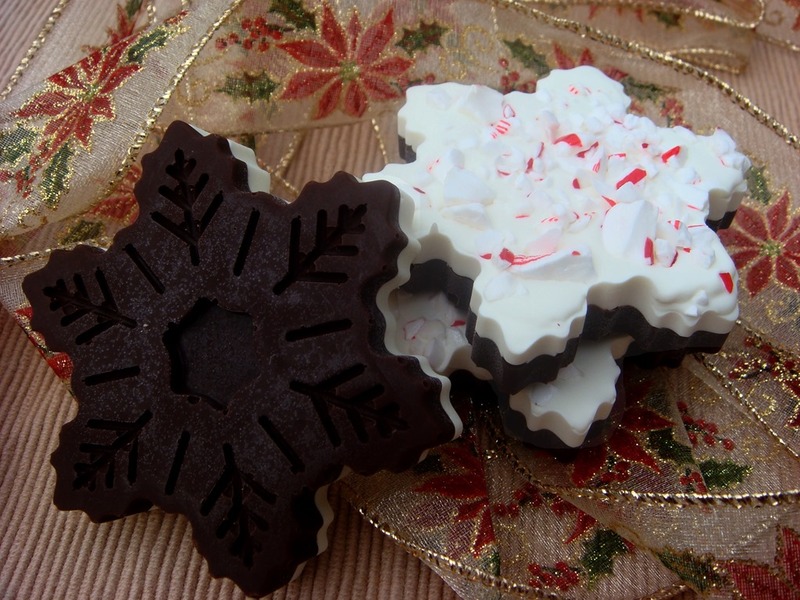 OR: Use a silicone mold to make fun individual Peppermint Bark Snowflakes. The bottom chocolate layer in this mold ends up with a fun imprinted design. Peppermint bark is simply layers of dark and white chocolate flavored with peppermint extract and sprinkled with crushed candy canes between the layers and on the top. I like to use very finely crushed candy canes (the “dust” that you get when you crush them) in between the layers, and the more coarsely chopped candy canes on the top layer. 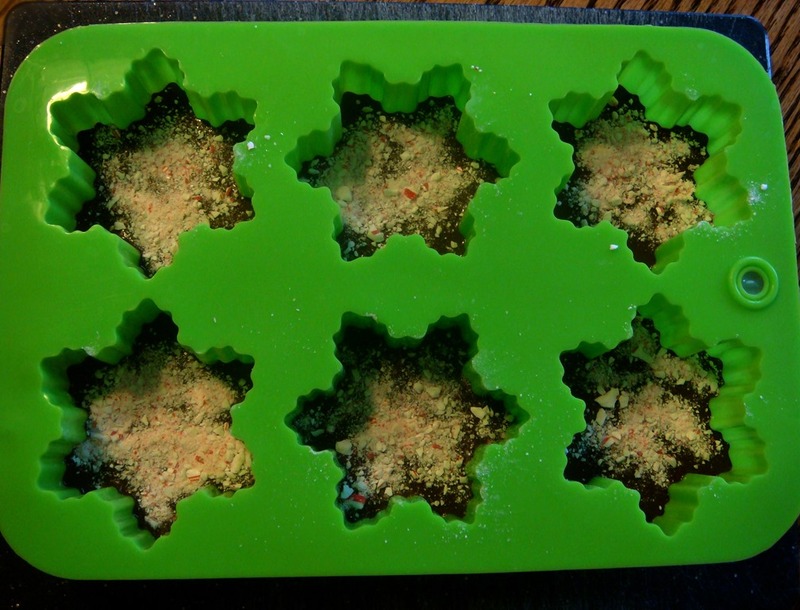 Let harden in the mold and pop them out for a fun treat. Or an easy, no-bake gift. Crush candy canes in a Ziploc bag or bowl. Reserve the larger pieces of crushed candy canes to use on the top of the peppermint bark. In a microwave safe bowl, melt dark chocolate in the microwave. Stir in 1/4 tsp peppermint extract. Spoon into a Ziploc bag. Cut off a small corner and use bag to pipe chocolate into 12 silicone snowflake molds. Use a toothpick, if necessary to smooth chocolate into crevices of molds. Sprinkle top of melted dark chocolate with finely crushed candy canes. Let dark chocolate harden for about 20 minutes in the refrigerator before adding white layer. In a microwave safe bowl, melt white chocolate in the microwave. Stir in 1/4 tsp peppermint extract. Spoon into a Ziploc bag. Cut off a small corner and use bag to pipe white chocolate over the dark chocolate. Use a toothpick to spread to the edges of the mold. Sprinkle with the more coarsely chopped candy cane pieces. Let bark harden completely. Pop out of molds and store at room temperature. If you are not using molds, spread layers of dark and white chocolate onto a baking sheet lined with a silicone mat or non-stick foil. Let harden and break into large pieces.